Microsoft has released Windows 8 and its Surface RT tablets are now in stores but more is on the way. 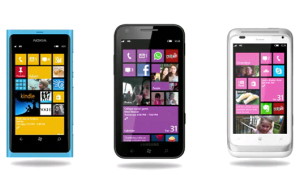 On Monday, October 29, the company is expected to release Windows Phone 8, which includes some impressive changes. For instance, the new start screen lets you resize app tiles based on importance, so if you care a lot about email or social network alerts, you can stretch out the appropriate tile to make it stand out. The camera software also is markedly better. Windows Phone 8 lets you to take panoramic photos and includes a new self-timer so you can take self-portraits without having to use the front-facing camera. It also includes a cool new feature called Smart Group Shot, which takes a burst of pictures and uses an algorithm to combine the photos into a composite that has the best qualities of all the pictures taken. Near Field Communications (NFC) is also big in Windows Phone 8—you can use it to send data from one Windows Phone 8 device to another simply by tapping them together. The OS also has a Wallet hub that works much like Apple's Passbook in iOS 6 in that it contains data about your credit and debit cards, as well as coupons, frequent flyer information, and loyalty cards. As for maps, Microsoft has opted to use Nokia's mapping software over its own, finally giving all Windows Phone users turn-by-turn navigation and support for offline maps. And if you were wondering what would replace the Zune desktop app that let you sync your media files from a PC to the phone, it will be a new Xbox Music service. On Monday, carriers are expected to announce pricing, availability, and pre-order details for the first round of Windows Phone 8 devices. Here’s what we know so far. The Nokia Lumia 920, which will be exclusive to AT&T, is Nokia's flagship device and has a 4.5-inch curved glass display with 1280-pixel-by-768-pixel resolution, a 1.5GHz dual-core Snapdragon S4 processor, 1GB of RAM, 32GB of storage, built-in wireless charging, and NFC support. It has a powerful PureView camera with “floating-lens” technology for image stabilization as well as interesting software such as Smart Shoot, which scans for unwanted people passing through photos, and can remove them from the image. Cinemagraph can add a touch of motion to parts of an image, such as a flag waving in the background. The Maps app will include an augmented reality feature called City Lens that lets you hold up the phone's camera to your surroundings and see information on nearby businesses. To take advantage of new screen-resolution possibilities in Windows Phone 8, the Lumia 920 has a “Pure Motion HD+” display. Nokia says the screen offers blur-free scrolling and enhancements to sunlight readability, so the phone can react to minimize sunlight glare. The screen also works through gloved fingers, so there's no need to buy special smartphone gloves. As for the Nokia Lumia 820, it’s a mid-range phone with 4.3-inch, 800-pixel-by-480-pixel resolution display (without curved glass), a 1.5GHz dual-core Snapdragon S4 processor, 1GB of RAM, an 8-megapixel camera with Carl Zeiss optics (not PureView), a VGA front-facing camera, 8GB of storage, and a microSD card slot. AT&T is expected to release the Nokia Lumia 920 on November 11, according to speculation BGR is floating. HTC announced the Windows Phone 8X and Windows Phone 8S in September. Of the pair, HTC's Windows Phone 8X is the flagship. It has a 4.3-inch, 720p display, a 1.5GHz Qualcomm Snapdragon S4 processor, 1 GB of RAM and 16 GB of internal storage and NFC. For the phone's 8-megapixel, f/2.0 aperture rear-facing camera, HTC is bringing along the ImageSense sensor found in the company's high-end Android handsets. The 2.1-megapixel front-facing camera supports 1080p video chat and an 88-degree wide-angle lens that can get four people in the frame at once. The HTC Windows Phone 8S is a mid-range device with a 4-inch, 800-by-480 resolution display. Other specs include a 1GHz dual-core processor Snapdragon S4 processor, 512MB of RAM, 4GB of storage, a MicroSD card slot and a 5-megapixel rear-facing camera and a front-facing camera. It does not support NFC. Both devices come with Beats Audio software, but only the 8X has additional amplifiers inside. AT&T, Verizon and T-Mobile will all sell the Windows Phone 8X and 8S but you can already pre-order the AT&T version at Best Buy for $99 on contract. In total, the phones will be available on more than 150 carriers across 50 countries starting in November, which will help amp adoption of Windows Phone 8. T-Mobile will get an exclusive Windows Phone 8 handset from Nokia, the mid-range Lumia 810. It has a 4.3-inch, 800-pixel-by-480-pixel resolution display, an 8-megapixel rear camera, and a 1.2-megapixel front-facing camera. The Lumia 810 will include wireless charging as well as 8GB of storage that can be expanded through a microSD card. The Lumia 810 doesn’t make use of the PureView technology found in Nokia's Lumia 920, so the built-in camera won't have any added image stabilization or low-light enhancements. However, the camera does include the Group Shoot feature as well as a Cinemagraph feature that creates animated GIF files. As for Verizon, documents leaked on Wednesday indicate the carrier will release its Windows Phones on November 12. According to a Minimum Advertised Price listing, Verizon will offer the Nokia Lumia 822 for $100 with a two-year contract, as well as the HTC 8X for $200, also on contract. Note that the rumored price is $100 more than what the HTC 8X is going for now at Best Buy. However, on Friday WPCentral said a tipster supplied photos of the HTC 8X and leaked prices. The source said the Lumia 822 will be $99 on contract and the HTC 8X will sell for $199. We don't have much word on the Samsung ATIV S, which has a 4.8-inch Super AMOLED display, is 8.7 millimeters thick with NFC integrated, runs on a 1.5GHz dual-core processor and has HSPA 42 connectivity. Who knows how someone pulled it off, but here’s a three-minute video of the elusive Windows Phone 8 handset.